It was just after five o'clock this morning as I walked upstairs to check my email. As I looked down at the keyboard, I saw this note sitting on my desk. 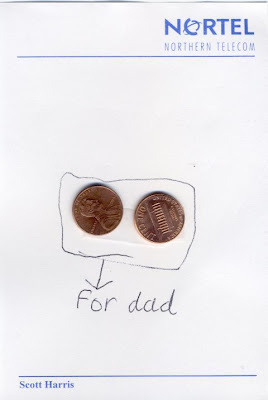 Apparently, this was a simple act of kindness from Luke, who found two lucky pennies yesterday and wanted me to have them. We must remember to be very thankful for the little things in life, like the simple expression of love from our children. How precious is that? Luke is such a sweetheart! What a sweetie! Olivia did something similar for Scott. She went through a small change jar he has on his dresser just to sort out coins. She pulled out the Canadian and the Euro coins and made a tent card pointing out which was which so he could take them on his travels. Scott still has the card sitting on his dresser, but he did as she planned and took the coins on his most recent trips. These kiddos won't be doing these things forever.......sniff.